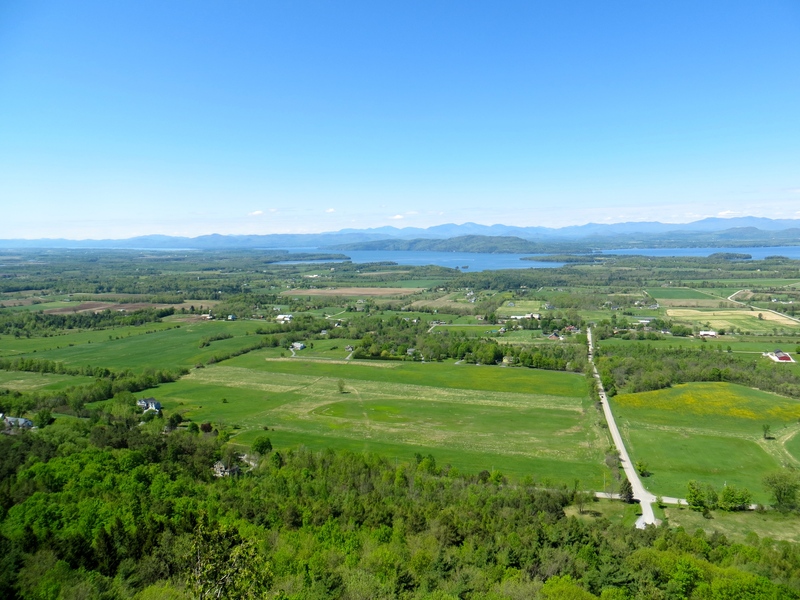 The family took a hike up Mount Philo today. We have a couple of nicknames for the place–Mount Dog Walk, Mount Fido. It lived up to its name today. We did not take the dog, but everyone else did. Or else, like us, they took their kids. There were some kids in backpacks, some kids in front pouches of various sorts, lots of kids on foot. Ours were on foot. They are way to big for some little pouch on the chest. We saw some interesting stuff. The leaves are really popping out now. 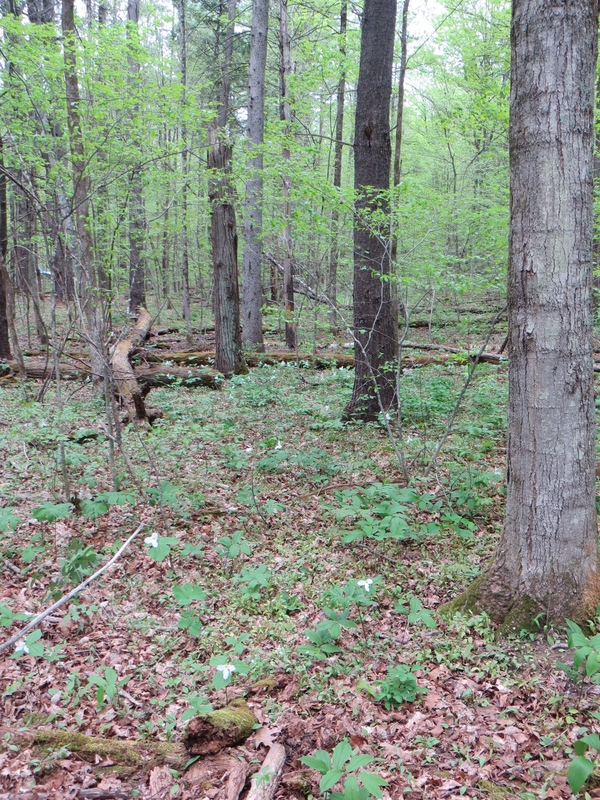 Trilliums were blooming in huge clusters. Columbine, apple blossoms, Solomon’s seal all busting out their stuff. We heard and saw a Chestnut-Side Warbler, Ovenbirds, lots of Robins doing their best to attract the ladies. The sun was shining and it was cool but not cold, warm but not hot. Couldn’t be nicer. We had a fine view at the top as well as a picnic lunch. Trader Joe’s just came to town (it opened two days ago) and we enjoyed Cookie Butter on pretty much all items in the picnic basket–bagels, strawberries, carrots, day old waffles. Those last ones were probably the best. Cookie Butter is deadly good. No wonder it is the best selling item at Trader Joe’s. Once we topped ourselves off with the Speculoos deliciousness of Cookie Butter, we headed down. 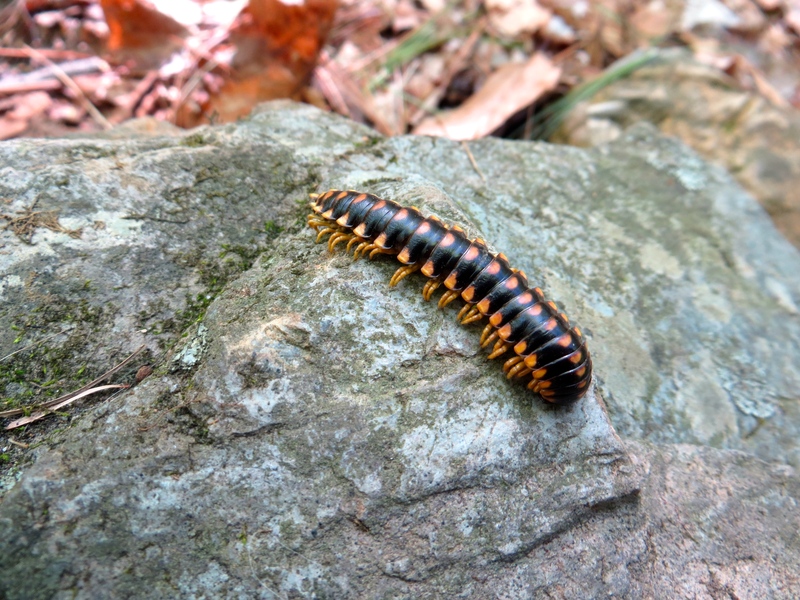 More millipedes, wind in the new leaves and gravity assist made us feel good. 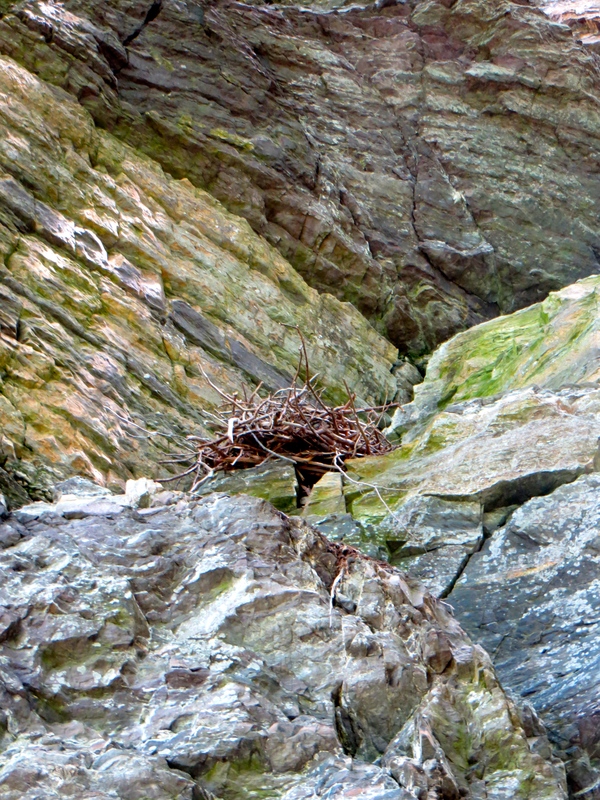 We saw a couple of Raven’s nests on the way down, on the cliffs of the Devil’s Chair Trail, and heard a Raven cronking away, out of sight. All in all, it was a spectacular day. 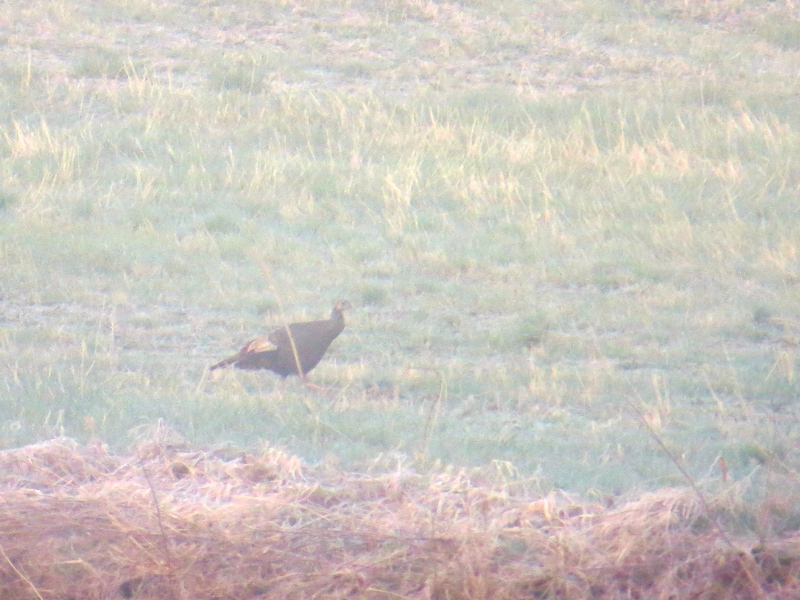 I started it off with some morning birding and brought my county year total to 148. Now the sun drops below the hills. A day of wonder, start to finish. 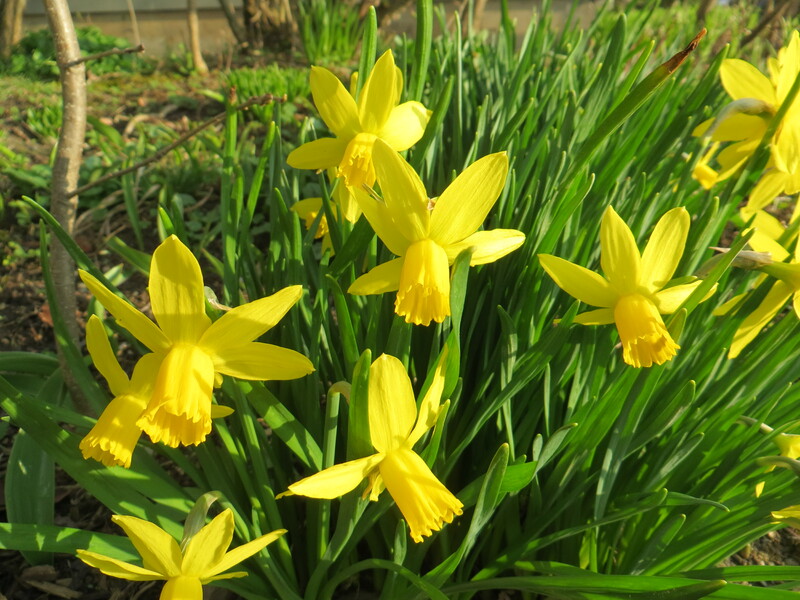 I even managed to get in some gardening, and in my late apathetic mood, that really makes the day a wonder. After work today I popped over to Niquette State Park in Colchester. 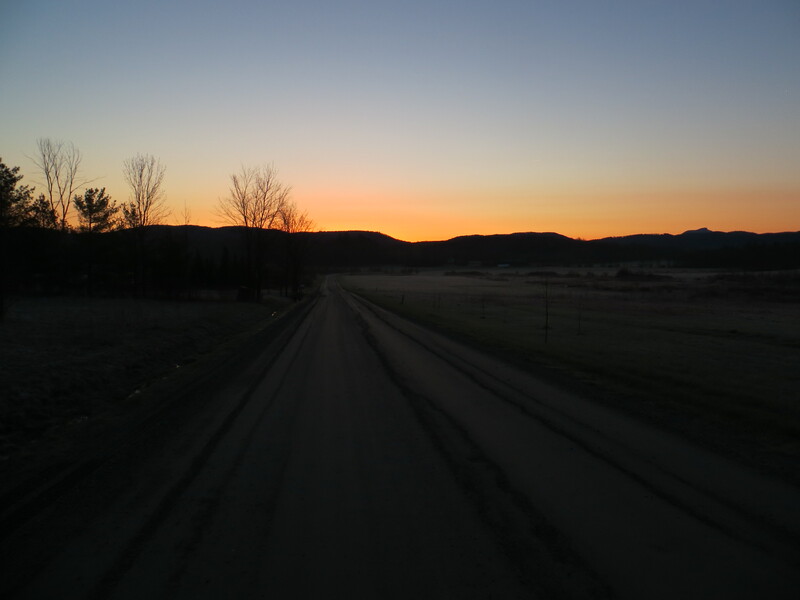 It is hidden not far from Interstate 89. Easy to get to, the place was not busy. I pulled into the parking lot and saw a few other cars. It looked like a group of runners. They were packing up and drove out of there before I got out of my car. One other guy was just tying on his shoes. We hit the trail at the same time. The place isn’t huge but it has several miles of trails. I had been there before and had taken the direct route right to the lake. When the lake isn’t at flood stage, as it is now, there is a beach. Now the water covers the base of the trees at the shore. It is wet. Today I took a different trail. I headed uphill on a rocky path with ledges and a even cliffs. 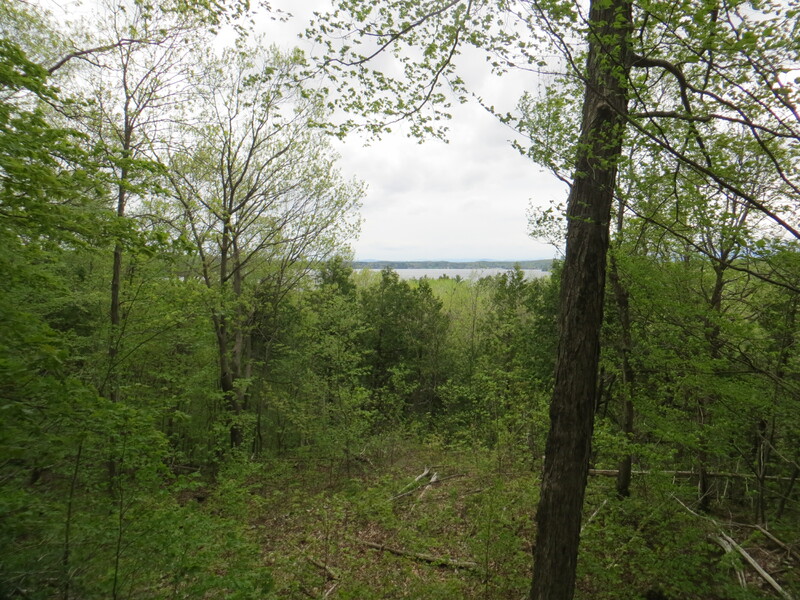 It wound around up to a lookout over the lake. It was beautiful. Maybe it was the gray afternoon with the bright green leaves just popping out. 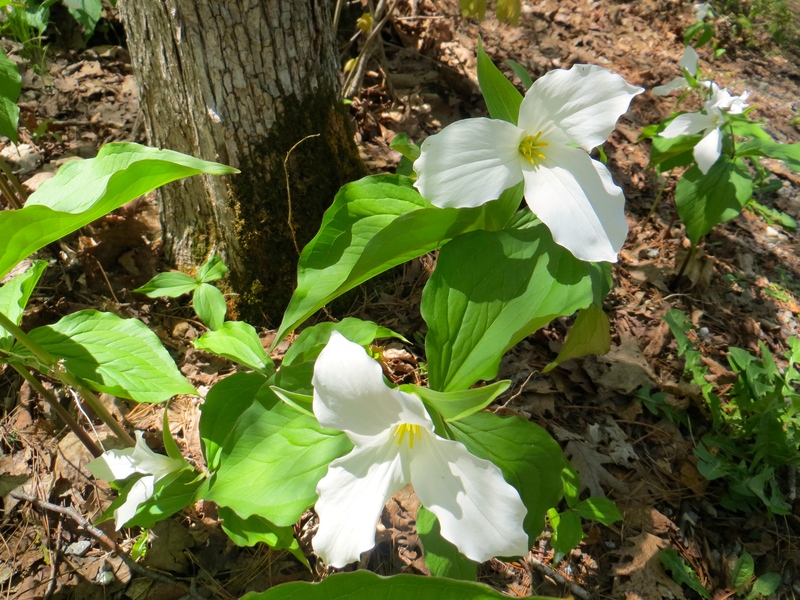 Maybe it was the white and pink trilliums blooming everywhere. Maybe the ledges looked their best in the dampness from the rain showers. I was blown away by how peaceful, even magical, it was on that high road. The runner passed me going the other way. He was cooking. It would be an amazing place to run–a good combination of smooth and rugged trails, with a few miles to keep it interesting. Today, however, I was looking for birds. I did not find many. A couple of warblers, a chickadee. I heard a Hermit Thrush calling and then flushed it; it landed close by and I got to check out its reddish tail bobbing. I heard one bird I didn’t know but it eventually flew off. Bummer. Farther up the trail, however, I heard another one. I left the trail to chase it down and eventually saw it. Scarlet Tanager. Bright red with black wings. A stunner. I listened to it call for a while so I can add that call to my mental audio files. With the tanager and the Baltimore Orioles I saw earlier, I am up to 138 birds I’ve spotted in Chittenden County–only 37 to go to reach my goal of 175 by the end of the year. I will definitely be back to Niquette State Park. The place is a gem. After Memorial Day it will cost three bucks to get in. Seems like a bargain to me. I almost never set an alarm. I wake early. I can’t help it. If I need to wake at 6:00 I wake by 6:00. These days I get up even earlier. Ideally I wake at 5:00. That way I can be out the door by 5:15/5:20. It is May. This is the time to go birding. Usually I wake by 5:15. This morning? 5:00 on the dot. Typically I sneak out of bed and head to the bathroom. The night before I lay out clothes to go out, based on the weather. When I rise I brush my teeth, pop in contact lenses, dress, and split. It is plenty light these days by 5:30. The sun rises just before 6:00. I slowly walk down the driveway, looking and listening for birds. This morning by the time I walked that tenth of a mile I had counted 15 different species. Today just past the fields and the river (Swamp Sparrows, Snipes, Barn Swallows, Phoebes, a couple Yellow Warblers and many others) I ducked up into the woods. This morning it was a birding bonanza. There is a window of days, and we’re in it now, when the leaves are not yet back on the trees and the song birds are starting to do their thing. Today I got the benefit of that. I saw my first Wood Thrush of the year (singing like a champ), my first Brown Thrasher, nine different warbler species (including Golden Winged, a hard one to find), a Blue Headed Vireo and a Rose Breasted Grosbeak. At one point there were 15 or so warblers in the trees around me flitting back and forth. It was a sight. When the sun tops the hills the birds move around, but not for long. By 7:00 things were pretty still. It pays to get out early. That saying about the early bird? Right on the money. Last year I heard about the challenge to find 150 different bird species in one county in a calendar year. I had been to South Africa in December and January and by March I thought this would be a good challenge to take on. 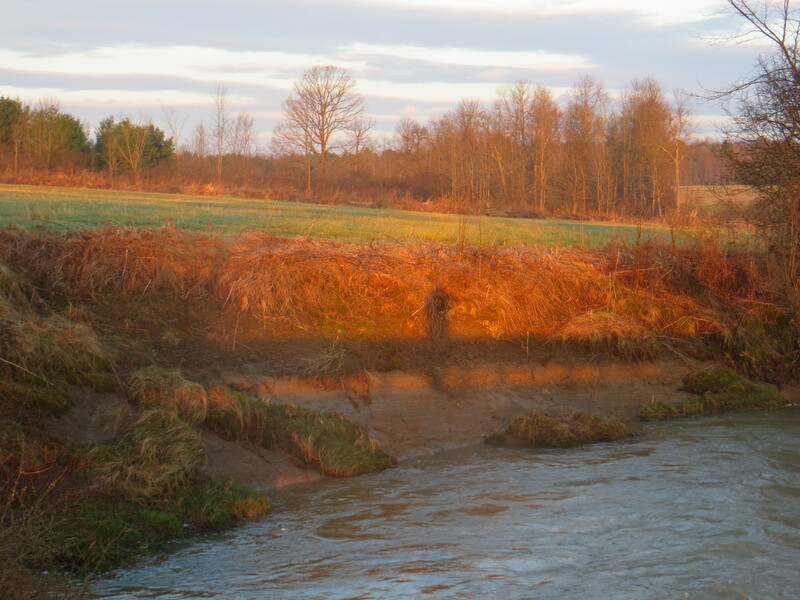 I started March 19th when I saw my first Bluebirds and Red-Winged Blackbirds. 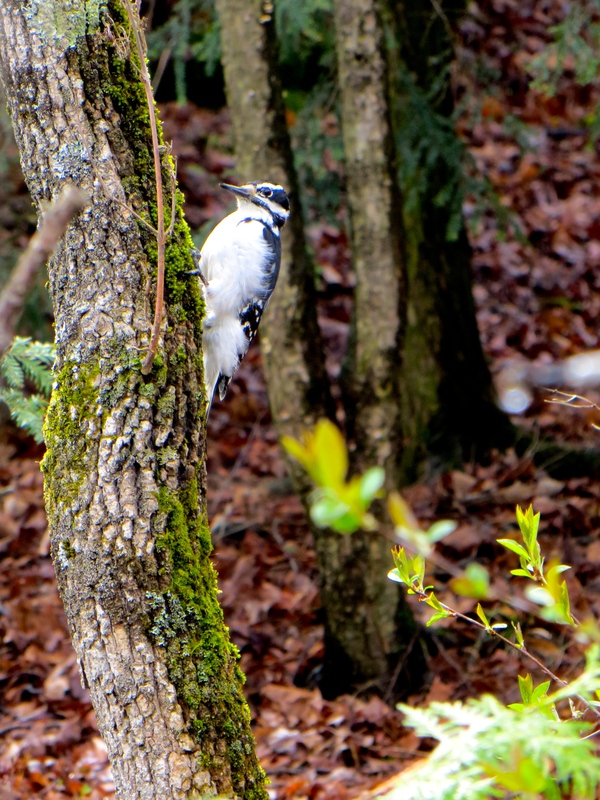 I went birding a lot, in lots of different places with lots of different habitats. By the end of December I was out there looking for anything I hadn’t found, mostly birds that come south from the far north. I found a couple in that last month. I had by then surpassed my goal and was aiming for 175. I got to 174. This year I decided I would have two goals. The first would be to find that 175 species of birds in my county this year. The second would be to find at least 200 species of birds total anywhere. I am off to a good start. Yesterday I took my son to baseball practice at the school. I ducked into the woods there while they practiced batting and catching. A stream flows through a strip of tall trees near the school, the athletic fields on one side and a meadow on the other. I finally saw a bunch of warblers. In fact I saw five different species within about ten minutes–Yellow-Rumped, Black and White, Yellow, Black-Throated Blue and Common Yellowthroat. Plus, I saw a bonus Alder Flycatcher. That last one I watched for a long time as there are several flycatchers that all look similar, but I finally narrowed it down. That one small venture into that patch of trees yielded five birds I had not yet seen this year. Sweet. Today I had 20 minutes on my way home before I had to be at the end of the driveway to meet the school bus. I stopped at a nearby wetland preserve. 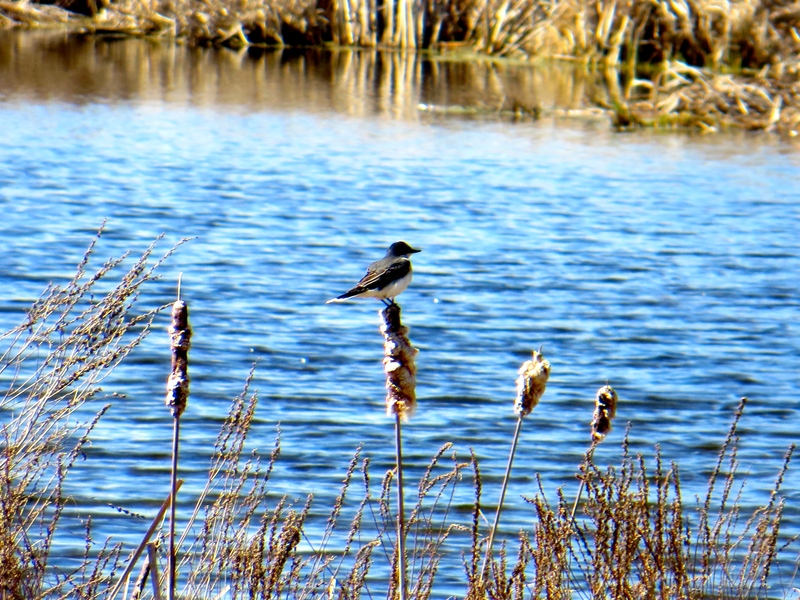 Before I even got out of the car I saw my first Eastern Kingbird for the year, then another. I also heard a Virginia Rail. I sort of saw it, but it was hiding in the reeds and I just caught a glimpse. The call was pretty unmistakable though, so it counts. I saw a couple of ducks way off. One of them might have been something new for me, but it is easy to see what one wants when it is far away. So those ducks went un-identified. As of today my county count is at 113. There are still plenty of birds I can count on seeing if I go looking. There are many more warblers, plus water birds and flycatchers, some hawks, several sparrows, and lots others. I am not worried about getting to 150, but 175 will still be a good challenge. My overall count for the year is 202, so that goal has been met by May. And May is the best month to go birding as all the locals are coming back and all the migrants are passing through. Even talking about it I am itching to get out there. I will try to head out right here in the morning–rise at 5:00 as it is just getting light and the birds are just singing. Who knows what I’ll see? I certainly don’t. That is why this is so much fun. Somehow or other I heard about Project Feederwatch this fall. 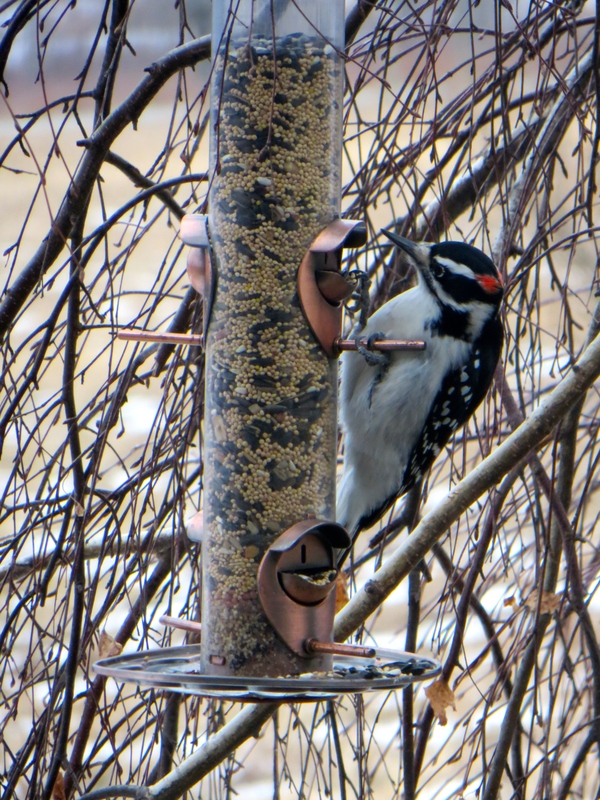 It seemed easy enough–sign up, watch my feeders and surrounding area each week, report what I see. Piece of cake. So I signed up. I watched my feeders and reported what I saw. Sunday and Monday were my days to watch (the project requires two consecutive days each week). I looked forward to getting up Sunday morning and seeing what was out there. It was a great way to take the time to look outside. I would count all the birds I could see of any species that I could see at any one time. It really was not hard to do. I got pretty excited when I got to report something that wasn’t around previously. Each time I would see American Tree Sparrows and Blue Jays and Chickadees. I often would see Juncos (they liked the morning hours) and a pair of Red Tailed Hawks hung around later in the season. I saw a total of 21 different species from November to April. It was another great way to get to know the place I live a little better. The thing is, I miss it. Now that spring is here I go out birding. I get to see a much bigger swath of my place. And I see a lot more birds. But those Tree Sparrows? They aren’t around any more. 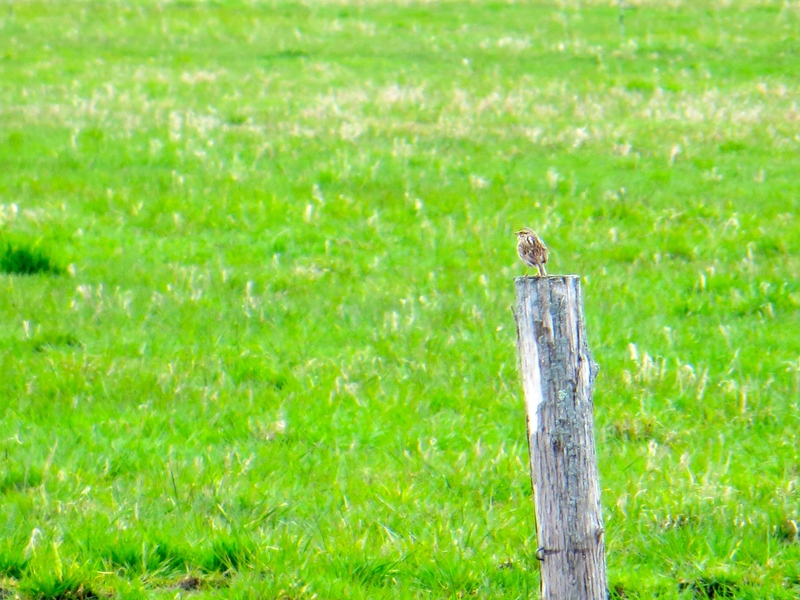 They left the same time the Chipping Sparrows arrived. And I mean exactly. One the Tree Sparrows were there, the next day the Chippers were there. Tree Sparrows were a comfort of sorts–seeing them another day was a sign that one more day was real and full of things to wonder at. I sat at the window with a cup of coffee, comfortable as I watched the birds simply do what they needed to do to survive. I wondered what happened when it got below zero and I wondered where they were when some of them simply didn’t show up. Now I just am lucky to see what I see; amazing but not comforting. I signed up for next year already. I will need to remember my registration number–not sure how I’ll make that happen. In the meantime I am going to try to see as many bird species as I can in my county this year. I’m aiming for 175. Right now, since January first, I am at 103. A good start.